Figure 15 Bosniak Category II hyperdense cyst. 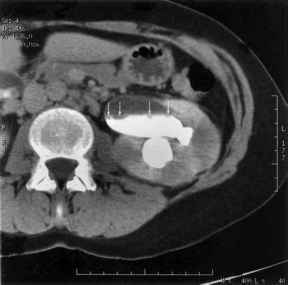 (A) A 73-year-old female with abdominal aortic aneurysm. 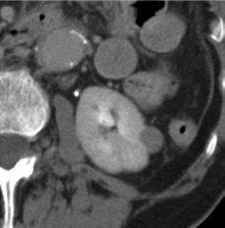 CT shows a 1.7cm homogeneous mass with attenuation of78HU on nephro-graphic phase image. Bosniak Category II hyperdense cyst versus solid, enhancing renal neoplasm. (B) Fifteen-minute-delayed scan revealed no significant de-enhancement with attenuation measurement of81HU. Abbreviations: CT, computed tomography; HU, Hounsfield unit. This group included nine proven renal cell carcinomas, two metastases, a nonlipoma-tous hamartoma, and five other lesions that showed enhancement when pre and postcontrast images were compared. Seven of the group of nine masses not showing de-enhancement had no evidence of enhancement where precontrast scans were available for comparison. This group also showed stability on short-term follow-up. A potential pitfall in the analysis of delayed imaging to detect wash-out or de-enhancement of contrast is the lack of an adequate bolus of contrast on the initial contrast-enhanced scan, preventing peak parenchymal opacification. The degree of de-enhancement in that case may not be sufficient to distinguish a benign hyperdense lesion from a hypovascular solid mass. Also, it should be noted that de-enhancement is a feature of all solid lesions, not just renal cell carcinoma. Other solid lesions, both benign and malignant, such as lipid poor hamartomas, oncocytomas, metastases, and lymphoma, would be expected to show this imaging characteristic, as noted in the above series. Suh et al. evaluated portal venous phase contrast-enhanced CT to determine what CT features might distinguish renal cell carcinomas from high attenuation renal cysts when only contrast-enhanced images were available (24). 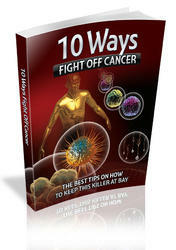 They investigated 57 renal cell carcinomas and 37 high attenuation cysts in 90 patients. The renal cell carcinomas were significantly larger in size, were greater in heterogeneity, and had higher attenuation than the hyperdense cysts. All lesions in their series measuring more than 110 HU were cancers. With regression analysis, they suggested that a threshold of 70 HU might be used to distinguish a cyst from neoplasm, but this is at odds with several previous reports of hemorrhagic cysts with attenuation measurements exceeding 70 HU. Although their study suggests that these features can be helpful in suggesting the presence of malignancy rather than a high attenuation cyst when unenhanced CT images have not been obtained, this information should not serve as a substitute for a dedicated, high quality, multiphasic CT examination, which, as previously mentioned, should include preliminary noncontrast images.